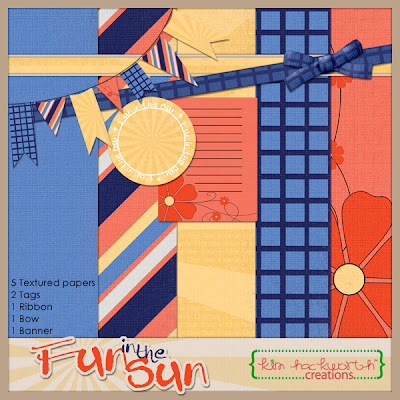 For my part of the blog hop, I made a mini-kit with 5 textured papers (4 are patterned), a circle tag, a banner, a journaling card, a ribbon, and a bow. You can pick it up by clicking the kit preview below. Just click the Next button for the next stop on the blog hop or if you need to go back, just click on the Previous button. Wonderful Kit Kim! Love it! Thank you so much for this post. I want to let you know that I posted a link to your blog in CBH Digital Scrapbooking Freebies (please, notice the new url for my blog), under the Page 5 post on Jul. 06, 2012. Thanks again. So very cute! Love your items! Thanks! Thank you so much for taking the time to put this kit together for us. Your kit is wonderful! Love the flags. Thank you ! Thank you so much for this post. I want to let you know that I posted a link to your blog in CBH Digital Scrapbooking Freebies (please, notice the new url for my blog), under the Page 3 post on Jul. 25, 2012. Thanks again.